This WorldView-2 imagery from DigitalGlobe, Inc. shows the healthy, complex Chub Heads reef and includes linear reefs, patch reefs, and seagrass beds. 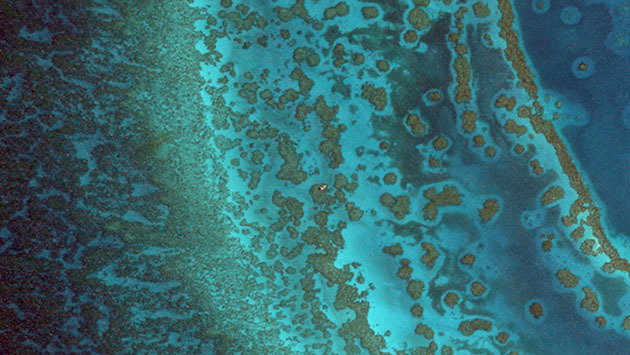 The sand halos around the brown reefs indicate a healthy herbivore population. Research Technician Stacy Peltier takes a core sample from a Porites astreoides colony for chlorophyll analysis in the lab. 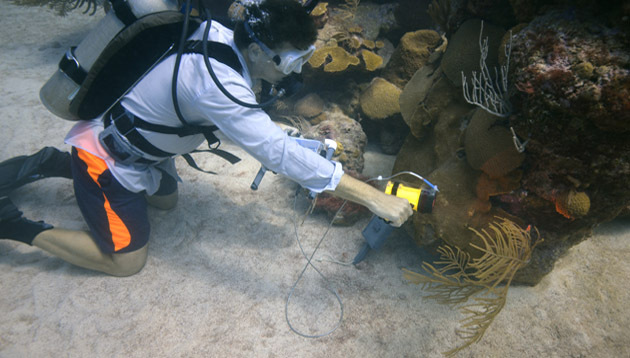 CREOL PI Eric Hochberg takes benthic reflectance measurements at Hog Breaker Reef in Bermuda. Globally, coral reefs are home to more than 1/4 of all marine species, making them the most diverse marine ecosystem. Because corals depend on the photosynthethic algae (zooxanthellae) within their tissues to grow and thrive, light is the primary energy source for these ecosystems. Scientists are interested in studying how light travels through the water (e.g., absorption, scattering, change with depth) in order to understand what portion of the sun's radiation is available to benthic ecosystems, including coral reefs, for growth. A second active area of research involves investigating how these benthic ecosystems utilize the available light to better understand aspects of ecosystem function, such as primary and secondary production and nutrient cycling. Collectively, the study of light and how it influences coral growth and reef development, as well as ecosystem function, is called "reef optics" or "reef bio-optics." Measure seawater chemistry to describe the environment in which reef organisms live. Optics to study how the benthic community utilizes light in an effort to understand ecosystem function. 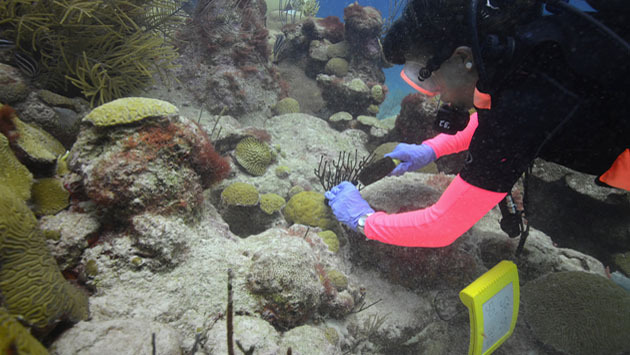 Funded annually by the Government of Bermuda Department of Environmental Protection, MEP helps meet the Department's mission to protect Bermuda's environment by conducting routine monitoring of the marine environment and both existing and potential sources of pollution. This is a five-year project, funded by the Corporation of Hamilton, for continued assessment of the coral reef ecosystem near the Seabright Point sewage outfall. The major concern driving the need for this assessment is the possibility that untreated sewage discharge might have a negative impact on the ecosystem.